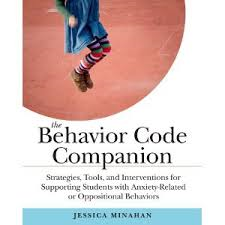 NESCA News & Notes: Jessica Minahan's New "The Behavior Code Companion" Available Now! Jessica Minahan's New "The Behavior Code Companion" Available Now! Author, HuffPost blogger, educational consultant and nationally-known speaker Jessica Minahan, M.Ed., BCBA is director of behavioral services at NESCA. Her impressive new book, "The Behavior Code Companion," is not officially scheduled for publication by Harvard Education Press until December 2nd. "Jessica Minahan translates complex knowledge about challenging behavior so that teachers and administrators have tools and strategies they can immediately implement. The Behavior Code Companion is a game changer that will help all schools that think they have run out of ideas." --Michael Cordell, chief academic officer, KIPP, Washington, D.C.
"The Behavior Code Companion is an invaluable resource for parents, teachers, administrators and related service providers, filled with tools that allow for effective and positive modification of challenging and interfering behaviors, while preserving the child's dignity." "Minahan provides so many creative and reasonable ways to overcome seemingly insurmountable obstacles that she makes me want to go back to public school teaching! What a much better place schools would be if all school personnel and mental health professionals used this book!" NOTE: We also have copies on hand of Jessica Minahan's first book, "The Behavior Code: A Practical Guide to Understanding and Teaching the Most Challenging Students." NESCA’s Behavioral Services department, directed by Jessica Minahan, M.Ed., BCBA, provides effective behavioral interventions to a variety of populations in multiple arenas. Specialized in working with children who have complex profiles, such as those struggling with anxiety, depression, Asperger’s syndrome or autism, as well as with children who exhibit oppositional, sexualized and/or withdrawn behavior, NESCA applies evidence-based practices that can be implemented in both home and school settings. From school staff training, behavior-intervention plan development and consultation to parent training and program consultation, NESCA helps school professionals and parents build capacity for the utilization of best practices with children.